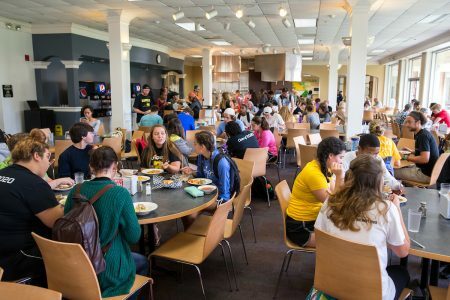 Randolph College is joining forces with Lynchburg Grows to reduce pre-consumer food waste. Earlier this year, Lynchburg Grows began collecting pre-consumer food waste like fruit and vegetable skins from Randolph’s dining services. The nonprofit group then uses the material for composting at the Lynchburg Grows farm. “Pre-consumer waste is easier to compost than post-consumer waste—what people leave on their plates—because it is less likely to be contaminated with non-compostable materials,” explained Sara Woodward, Randolph’s sustainability coordinator and assistant to the director of buildings and grounds. This is the first formal partnership between Randolph and Lynchburg Grows, and Woodward hopes this project will lead to more opportunities.